What a breath of fresh air. What a nice change from the last few weeks of splintering curling teams all across Canada announcing their break-ups. Just as the season-ending Players' Championship in Summerside, Prince Edward Island, gets underway, Jennifer Jones and her team have provided Canadian curling fans with some good news. Two months removed from a perfect run to gold at Sochi, Team Jennifer Jones has announced that they will be staying together. Not just for next year, but for another four years, at least, as they set their sights on an Olympic repeat in South Korea, in 2018. 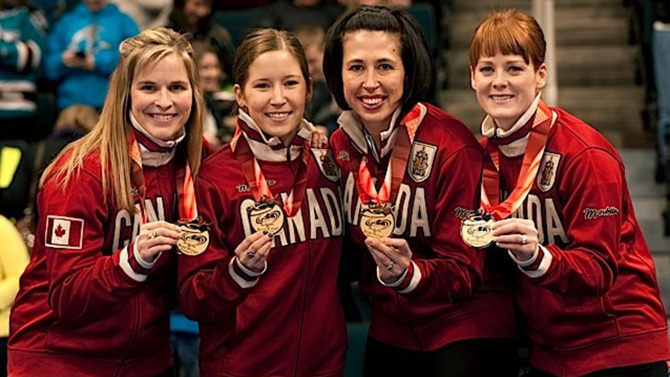 Jones, third Kaitlyn Lawes, second Jill Officer and lead Dawn McEwen became the first women's squad to complete an Olympics without a loss. They very nearly pulled off that trick at the Olympic Trials, as well, losing just once. At the top of the women's curling world right now, Jones and her team will turn their attention to trying to win national and world championships over the next three years, before once again ramping up their Olympic aspirations. There had been some talk that the team might be nearing the end of the line, like so many others. This announcement puts an end to the speculation that had fans of Team Jones worried that the gang was riding off in different directions, even as the glow of Olympic glory was still shining bright. While the team's coach, Janet Arnott, will not be returning, the crew on the ice will remain the same. This news is refreshing because, as mentioned, there has been a torrent of change overwhelming the sport over the last three or four weeks, particularly on - but not exclusive to - the men's side. Kevin Koe will have a completely new team next year, while Glenn Howard sees half his roster change. Jeff Stoughton is without a rink for 2014-15, as is Kevin Martin, leading many to speculate about retirement being in the cards. On the women's side, reigning Manitoba champion skip Chelsea Carey has already left for Alberta, while Rachel Homan's Scotties champions have a change in their line-up, with second Alison Kreviazuk leaving and being replaced by Joanne Courtney, who has left Val Sweeting's team. In January, Kelly Scott announced that her team was splintering as well. With Jones' announcement that her team will remain intact, Canadian curling fans get a breather from all the shifting puzzle pieces.